4) Overlapping somewhat with the last group are those commenters who know enough to answer general questions with high confidence. They are not necessarily “experts” but have been initated into the language of the field, have experience reading the primary literature or going to academic conferences, and would have the ability to speak authoritatively about certain issues to non-technical audiences. These people can stimulate very interesting discussion within the comments and clarify points of confusion that people in the previous categories have, making it much easier on the scientists such as Rasmus or Gavin from having to respond in detail to everything. “Moving forward” in understanding is probably the most difficult for this group because by this point, the resources which are easily accessible (e.g., the web) are no longer highly educational and any further detail will likely require taking several years to go to grad school or delve into upper-level textbooks. 5) Finally, there are experts who have spent decades working in the field and have learned (and work with) the very fine details of the topic in question, and can thus discuss the very nitty gritty if the comments happen to ever reach that point. One can expand and sub-expand upon these…perhaps including children and high school age people who you want to get “listening” without overwhelming with technical details. How one falls into such broad categories of course depends on the specific topic. One can be in the last category and have expertise in ice core research yet fall in the second to last category and only have a “good enough” understanding of radiative transfer. Group 3 in particular is likely to encompass engineers, biologists, chemists, etc….people who can follow scientific arguments but don’t necessarily know a whole lot about climate change. Presumably group 2 encompasses the vast amount of readership on the climate blogosphere, and is probably a good target audience for popular discussions of the greenhouse effect. Outside of RealClimate and other sites, there is of course a much larger group in the real world: those who don’t even think about climate change. This is most people. At most you might get a few words muttered about global warming at the dinner table, maybe from watching Al Gore, but for this group it’s an issue isolated from them and not within their scope of interest. It’s not my intention in this post to describe how to get this group listening, but that’s clearly a big subject for another discussion. I believe that it is necessary to have information available at different levels of sophistication, particularly for those people who already know the basics and want to move past simple “cartoon diagrams” of the greenhouse effect, yet at the same time have no desire to read literature at the level of Goody and Yung or go through the integrated forms of the Schwartzchild equation describing the transmission and emission of radiation through a medium. Communicating to group 1 is not possible. It is insane to presume one can teach someone that has no intention of learning, or that you can fill their “knowledge cup” with water when it is already full of mud. It is still worthwhile to respond to their criticisms, not for group 1’s sake, but to help people in the other groups sort fact from fiction while simultaneously enhancing their own knowledge. It reminded me of old “Scientific American” articles from the ’70’s that I would struggle to understand as a highschooler and college student. Often I didn’t get past the first page or so, but if I really worked at it and talked about it with my nerdy, more-scientifically-literate friends, I could usually figure out most of it and felt better for the mental exercise. Now I realize many readers may not have access to nerdy scientific friends, although RC has a comment board where it is easy to ask questions, discuss amongst groups 2/3 who can share links and ideas, and obtain answers from groups 4/5 (who also serve to to push groups 2 and 3 in the right direction should their well-intentioned curiosity start to take them to wrong answers). The argument that the post is “too technical” is not convincing, and as wili points out, work of this sort can serve as a great mental exercise for those curious about building up a more complete understanding. The post itself links to many external resources as well as other RC posts covering the same topic from different angles. This, with the help of fellow peers on the comment board, should allow most people to work through the logic of Rasmus’ post. If the object is to use Rasmus’ approach in more accessible venues, such as general talks to college students at universities, secondary media outlets, etc then I think it is a good one although with some trial and error modifications. It is a good approach to build up a step-by-step case for the greenhouse effect and global warming where each step can be understood completely and without complicated jumps in logic. It is also reassuring to know that the argument for global warming stems from physics which has its roots in pioneering work that is over a century year old; it does not only emerge in complex computers, nor is it a “hunch” by scientists who simply seen a temperature-CO2 correlation and declared that it must be causative. The part about feedbacks and stratospheric cooling tends to mesh discussions which are typically associated with the “amplified greenhouse effect” instead of the natural greenhouse effect itself. There is no reason they need to be exclusive, but they serve as an unnecessary point of confusion. Stratospheric cooling is sometimes helpful to point out, upon further questioning concerning the human fingerprint in global warming, but the broad picture of the greenhouse effect is not particularly sensitive to what is happening in the stratosphere. The part about negative feedbacks is unreadable to anyone who didn’t already know what feedbacks are. It is of course not possible to do justice to these details in one concise post (perhaps a multi-part series would have been better?) but if that’s the case then unnecessary complications, following the Einstein quote in the opener, are better left unmentioned. There are different levels one can understand the greenhouse effect at. For quick and easy descriptions, such as one might communicate to a young audience or for a quick 30-second sound byte at dinner with you parents, you might leave it at “certain gases in our atmosphere absorb heat that is escaping to space making the surface warmer than it otherwise would be.” The most simple visualization is typically one which treats the atmosphere like a single slab of infrared absorbing molecules and is transparent to incoming solar radiation. This is fine for illustrative purposes. I believe something similar to Rasmus’ post is a good next step up. I find the more sophisticated versions of the greenhouse effect tend to move the focus from a “slab” of molecules radiating energy downward to a focus on the top of the atmosphere energy balance. Some versions, such as described in David Archer’s “Global Warming: Understanding the Forecast” and Dennis Hartmann’s “Global Physical Climatology” articulate the so-called “layer model” where you throw in a bunch of “layers” at different altitudes which radiate according to their temperature by Stefan-Boltzmann. Often they are assumed to be fully transparent in the visible and a blackbody in the IR, although this does not need to be the case, it just makes for ugly algebra (Grant Petty works through a simple example of non-unity absorptivity and emissivity in a grey atmosphere in his Radiation book). I’m not sure how helpful the “layer model” is and it usually involves a good deal of trickery to get results which make sense (e.g., “one layer still isn’t enough but adding two layers gives you the observed temperature!!”). What does this even mean with respect to the real world? At still more complete versions, one inevitably needs to account for a convective troposphere and the spectral dependence of absorbing gases. It takes some time to build up an intuition and some higher-level reading in order to discuss the processes involved at this level, but one does not have to be in expert in group 5 to do so. Rasmus’ post serves as a useful bridge for the most simple of descriptions to the more complicated split-spectrum and lapse rate descriptions. The aim is good communication and this requires information accessible to a broad range of audiences. The reader will have to judge for themselves whether they are equipped with the tools to handle the level of sophistication in any particular description, or how willing they are to learn, but it is very easy to find articulations of the greenhouse effect accessible to almost anyone. But I do like Rasmus’ and others suggestion that a paradigm shift should be made to articulating global warming to lay audiences through the framework of step-by-step physics. Perhaps you skipped over my (ccpo) post suggesting writing this up at a level the scientists are comfortable with, then enlisting others to “translate” it for other levels. As I pointed out, this is what teachers do to scale content to grade levels. I.e., I said what you just said, but in a post not much longer than the one you are reading. I’d be happy to help out, particularly on versions for children and adolescents. Thank you. Being that the real climate post came out over the holiday, I would have missed it had not I seen your post on the topic. Most people are familiar with how a fog or cloud of dust affects visibility. Rather than taking individual layers, I think it’s helpful to think of what an incandescent fog/dust cloud looks like depending on where you are and how thick the fog is and how the temperature varies. For people who have trouble visualization how that works, I thought of a diagram: show a cross section with a people at some different locations embedded within some color distribution, where the color of some little particles depends on their location. Then show what each person sees in various directions. Then increase the density of the particles and show it again. I’m intrigued by your suggested illustration, but I can’t understand it from your written description, which is probably why I’m an illustrator :). Can you elaborate? Color distribution: is it linear, eg. red to purple? horizontal or vertical? Does color value equate to particle density? I’m not trying to criticize with my questions, rather, I want to try to draw what you have in mind. Color represents temperature. To illustrate the effect on radiation, only the particles that can absorb and emit are given the color that is assigned to their location. … or color could represent the radiant intensity that would have that brightness temperature; thus, that is the intensity you would see coming from a direction where all the particles within view have that temperature. … or color could represent the radiant intensity that would have that brightness temperature; thus, that is the intensity you would see coming from a direction where all the particles within view have that temperature, and where the particles fill the view in that direction. The pictures that show what is seen could be circles representing a hemisphere of directions centered on vertical (upward or downward), with area within the circle proportional to solid angle scaled by cos(angle) from vertical – this would then illustrate the flux per unit area as being proportional to the ‘average’ color of the circle – but such mathematical precision isn’t necessary to give a good qualitative sense of how it works; for that it would be sufficient just to show what it looks like looking straight up or down. The one problem is that color is two-dimensional (probably three if you’re in one of several non-mammal categories) whereas temperature and radiant intensity are one-dimensional – one could use a greyscale, or more-eyecatching, stick to a blue-red scale. One possible point of confusion is that this color doesn’t represent a wavelength of light, but the intensity of radiation, either in total (for optical properties that are invariant over the relevant portion of the spectrum) or at any one particular frequency. If the link doesn’t work, follow the link attached to my screen name. The top part looks a lot like what I was thinking of for the vertical cross section (including the axis showing temperature and the radiant intensity for the temperature). I would have used a black background so that, in the view one would have looking up or down through the atmosphere, gaps between the particles would be black (indicating nearly zero K or otherwise lack of radiating matter) or would show the surface (the surface should have the color corresponding to the surface temperature. I’m not sure what you had in mind for the bottom diagram – are those the mirror balls/prisms showing scattering? Probably best to skip scattering for now. I was thinking of placing three markers within the vertical cross section (just above the surface, somewhere in the middle of the atmosphere, and above the atmosphere), and then for each of those, having two views shown of what it looks like looking upward, and what it looks like looking downward. To emphasize where the viewed radiation is coming from, lines could be drawn from a marker to some of the particles that are in view from that marker. Beyond an introductory level, the views shown could be circles representing a hemisphere of directions (one up and one down; the edges would be looking sideways and the centers would be straight up or down; the angle from vertical would be the distance from the center, except that the radiation coming from more sideways is less important, so actually, the distance from the center of each viewing circle would be the sine of the angle from vertical (up or down). The average radiant intensity of a circle is then proportional to the flux through a unit area; to illustrate why, each marker could be a flat horizontal line segment, and sets of parallel lines from that line segment could be drawn going in various directions; the width across each set of lines going in some particular direction would be equal to the cosine of the angle from vertical (up or down) and thus this would show that radiant intensity coming from closer to sideways makes a smaller contribution to the flux per unit horizontal area. … Of course, at some point it should be mentioned that in actuality, the molecules/etc. that are actually absorbing (blocking) and emitting radiation are very numerous and small, and while they can be assigned an effective size over which they act like opaque blackbodies, they actually act in a probabalistic way that blurs out… The effect would be like taking one of those views and locally mixing the colors; the intensity seen in any one direction generally comes from many molecules along that direction, with the molecules in front partially blocking those behind. Hi Chris – This being a lazy Saturday afternoon, I thought I’d spend time exploiting the intelligent calibre of this forum to continue the RC discussion of stratospheric cooling (from Rasmus’s GHE blog). This phenomenon isn’t central to climate change, but it’s important for two reasons. First, it has diagnostic value as an AGW fingerprint, both for scientists and for the public. Second, it totally confuses most people who try to understand it, and they are eager for an explanation that’s both correct and intuitive. I have found Raypierre’s explanation in Chapter 4 of his upcoming book plausible and convincing. Although the chapter deals in part with hypothetical atmospheres, he offers his conclusions about this phenomenon to explain the real world atmosphere that experienced stratospheric cooling in recent decades – i.e., an atmosphere with varying optical thickness dependent on wavelength. To recapitulate his argument briefly, stratospheric cooling from added CO2 requires the CO2 to increase its IR emissions to space more than it increases the amount it absorbs based on its higher concentration. That is not possible simply on the basis of CO2 alone, which can’t emit more unless it absorbs more, warming in the process rather than cooling. 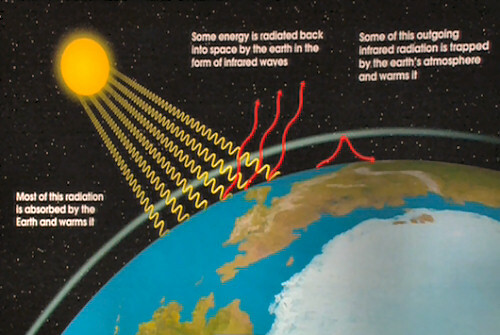 The source of the excess emissivity comes from the warming of the stratosphere by ozone via its absorption of solar UV. The extra heat excites the added CO2 to radiate away more than it would have based on its own properties. This is why, according to Raypierre, ozone is required to explain the cooling effect of CO2, and without ozone, added CO2 would warm the stratosphere. So much for what I see as a logical mechanism. How about alternative or additional mechanisms? Of those posted on the Internet, 99 percent are probably wrong. Most attribute stratospheric cooling to a reduced IR flux into the stratosphere due to IR absorption by extra CO2 in the troposphere. Even during a radiative imbalance due to CO2 forcing, I believe it’s possible to show that this could not account for the stratospheric cooling, but I won’t go there, because the more salient fact is that the models show a stable cooling in the stratosphere at higher CO2 levels at equilibrium – i.e., when OLR from the troposphere has returned to its level prior to the CO2 increase. How about a more subtle mechanism? A few years ago, I had a brainstorm, and posted my idea on an Eli Rabbett blog (it’s probably still around). My thought: perhaps the same flux as before entered the stratosphere, but more of it bypassed stratospheric CO2 because it was coming from an atmospheric window region, which after all, with a warmed surface, would emit more IR. I was proud of my idea for about a week, until I realized it was almost certainly wrong as an explanation, and in fact, carried to its logical extension, would probably require us to postulate a Second Law violation for the “bypass” (which does occur) to mediate cooling. Rather, what happens is that OLR within the width of the CO2 band would indeed decline slightly, but this is because the radiating layer within that band rises to a higher, colder altitude. It remains colder because of the bypass effect, but within any given layer of the band, the temperature is actually warmer than before, until the altitude rises to a point in the stratosphere so thin optically that the difference between before and after essentially vanishes, but never reverses. Let B = “before CO2 addition”, and A = “after added CO2”. Divide the atmosphere into, say, 100 layers. Start at a low altitude (but we’ll stay above the boundary layer simply to avoid the non-radiative processes there that complicate the logic). At our arbitrary layer, N1, we can probably agree that N1-A is warmer than N1-B due to the well understood greenhouse effects in the troposphere. How does that affect N2? The warmer N1 will now send more IR to N2, creating a warming influence. N2 would actually receive more IR from higher layers as well, reinforcing the effect. Not all of the N1 emissions would be absorbed by N2. Depending on where we are within the CO2 band, a smaller or larger fraction would escape to space. However, the effect on N2 would always be one of warming. I think you can see where we are going with this – whatever is true of N2 would apply to N3, N4, etc., up until the very thin layers within the stratosphere that no longer contain meaningful quantities of CO2. Note that as we go higher and higher, less and less of the emitted IR is absorbed in the layer above (because its CO2 quantity is lower), and more and more escapes to space (at least outside of the band center), but the amount of added heat always remains positive until it asymptotes to zero somewhere in the stratosphere. As long as a lower, warmer layer in the “Before” atmosphere grows even warmer in the “After” atmosphere, it can’t cause a cooler layer above it to become cooler still without a Second Law violation. That cooler layer could only cool further if some additional moiety added to its IR emissivity without equally adding to its ability to absorb IR from below. I see this explanation as one means of visualizing Raypierre’s assertion that in the absence of a stratospheric warming moiety such as ozone, added CO2 will slightly warm rather than cool the stratosphere. Indeed, in the absence of ozone, the distinction between troposphere and stratosphere becomes very blurry, and we are simply stating that when we add CO2 to the atmosphere, it warms all layers to an extent that vanishes when we go high enough. Finally, none of this will interest readers who simply want to know whether AGW is real, nor readers who simply want to know what the models say without knowing why. For me, though, it’s enjoyable. Raypierre and I would welcome comments (although somehow I don’t think he realizes he has issued that invitation). I just posted that same idea on RC within the last few days. I more or less stumbled onto while thinking about the process stepwise: initial stratospheric adjustment, then tropospheric+surface response with stratospheric feedback. I’m not sure I see how it necessarily violates the 2nd law. Hi Patrick – I may have addressed some of your questions in my response to Chris, but if not, let me know. Here are my Second Law questions, which assume, for simplicity, an atmosphere with only radiative energy transfer and only CO2 as an important mechanism. Let N1 and N2 be a lower (warmer) and cooler (higher) layer respectively, one just above the other. Add CO2 to both. We know that in the troposphere, N1 will warm via greenhouse mechanisms. Is it possible, at any altitude, for N2 to cool? N2 will receive extra IR from N1. For it to cool, it would have to emit an even greater excess of IR, including downward to N1. Wouldn’t this mean that the already cooler N2 layer would have to cool further by sending a warmer layer more heat than it receives from the warmer layer? One can add even higher layers – N3, N4, etc. – but that simply transfers the problem upward by requiring a multitude of cooler layers with extra CO2 to become cooler still by emitting a net excess of heat to the multitude of lower layers that are warm to start with and warming further. I realize the atmosphere is more complicated than that, but I haven’t seen claims that the other factors make a difference. The only exception seems to be ozone, as proposed by Raypierre. If ozone can heat a stratospheric layer, extra CO2 there can increase IR emissions by virtue of the fact there are more CO2 molecules to do it. It would not involve a net transfer of heat from a cooler body to a warmer one, because the extra emissions would come from a warmer part of the stratosphere. I should qualify my comment above by suggesting that the problem is not so much a net heat transfer from cooler to warmer layers via cooling of the cooler layers, but rather that for the postulated scenario to explain cooling, it would require that cooler layers, on absorbing extra heat from below when CO2 levels rise, would have to emit an even greater excess of heat than they receive in order to cool. Since we know that OLR from within the CO2 band is actually diminishing with a shift to window regions, this would require a net flux of most of the excess heat from the cooler layers to be directed downward toward the warmer layers rather than outward in the cooler direction toward space. If the system was previously in equilibrium (e.g., no net entropy change), this diversion toward the warmer layers would constitute a spontaneous reduction in entropy. Sorry for my incremental approach to commenting as I reflect on the issue. I still don’t think my two responses above regarding the Second Law accurately describe the thermodynamics violation. I would delete much of those two responses and replace it with the following: What is implausible thermodynamically is for a system with a sole heat source (a warmer layer below it) and an unchanging heat sink (space) to receive extra heat from the source and thereby cool by shedding an increment in heat greater than the increment it received from the source. It would be analogous to a room with a fireplace and an open window. If we turned up the fire and expected the room to cool down, we would be asking it to spontaneously give off more heat than before while at a cooler temperature, but without opening the window any wider (Regarding the absorptivity/emissivity balance, note that it wouldn’t help the room to cool down by changing the wallpaper from gray to black). I believe Lacis is wrong for the same reason I was when I thought like he did, as I tried to explain above. Parenthetically, grey gas atmospheres would seem to be irrelevant because we don’t live in one. Raypierre’s analysis involving ozone was one he applied to our current atmosphere, not a grey gas one. It is true, as Lacis argues, that increased CO2 shifts some OLR escaping to space to window regions. The error is to confuse that phenomenon with the conclusion that because less OLR escapes to space within the CO2 band, less heat is absorbed by the atmosphere within those wavelengths. In fact, more heat is absorbed, less escapes to space, and the result should therefore be a warming of all layers (if ozone were absent), including a warming of the surface, capable of mediating the extra emissions via the window. Nothing in the Lacis argument (and my prior embrace of it a few years ago) refutes the principle that with increasing CO2 alone, a heating of a lower layer can’t cause the cooling of a layer above it to a temperature below its previous level. The shifting to window regions simply means that the heating within the CO2 band regions is less than it would be without the shift, but it is still heating in the positive direction. Because that shifting is compatible with a warming of all layers, an effort to refute the analysis I’ve presented would have to specifically identify how CO2 absorption/emission would behave differently from the manner I described, with particular reference to the inductive reasoning cited. I’ve tried to identify an error, and I can’t. Probably more importantly, Raypierre’s explanation requiring the presence of ozone to explain CO2-mediated stratospheric warming would also need to be refuted. It appears very sound to me, but anyone who can find errors in it should describe them. … because the surface+troposphere response is tied to the heat capacity of some portion of the upper ocean, whereas the stratosphere can reach radiative equilibrium in considerably under a year, so there is some cooling above the tropopause initially that will dissapear when the upward LW flux from below increases to restore equilibrium. (The tropopause level forcing is often given as the forcing at the tropopause with that initial stratospheric adjustment, which allows more direct comparison for the effects on the surface+troposphere among forcings that have either stratospheric warming or cooling effects. There is some positive feedback at the tropopause level when the surface+troposphere warm up because this warms the stratosphere (to the extent that it absorbs some of the radiation from below) which increases the downward LW flux from the stratosphere (a fraction of the total increase in LW flux out of the stratosphere that must balance the increased LW flux from below that is absorbed) – this feedback being small if the stratosphere absorbs only a small fraction of the LW radiation from below (which is the case for Earth). Of course, positive albedo feedback would tend to warm the stratosphere by requiring an increase in OLR. If there are ozone feedbacks … etc. My argument is that reduced OLR does not require a portion of the stratosphere to have cooled, but merely for the radiating layer for that part of the spectrum to have risen to a cooler altitude due to the increased optical thickness imposed by the increase in stratospheric CO2. Compared with the lower CO2 condition, any given altitude will still be warmer. If there were no spectral shift, OLR from the CO2 part of the spectrum would be the same as before at equilibrium, the temperature at which CO2 achieves that would be the same as before, and the only difference would be the higher altitude at which that temperature was achieved. Because of the shift, the OLR from that part of the spectrum doesn’t quite get to that intensity, which is why it can occur without the higher altitude warming up as much. But it will still become warmer than that particular altitude was prior to the extra CO2, given that in the earlier circumstance, that altitude was not the radiating level but was above it, and colder. Note that this assumes an absence of ozone, and therefore a declining temperature with altitude at levels we now see as in the stratosphere, leveling off toward the skin temperature as the CO2 concentration diminishes to very low levels. The temperature inversion due to ozone precludes the decline to colder levels with altitude that would let CO2 emissions diminish with altitude. Yes, I was in error to assume cooling aloft as necessary – of course, the increase in OLR at some wavelengths can be balanced by the widenning of the CO2 band (the center of the CO2 band would tend to show no change once equilibrium is established, in the condition of no solar heating of the stratosphere). So at least in this crude form, it is not an argument for stratospheric cooling absent stratospheric solar heating. So I need to go back and draw out what the spectra look like before, during and after – PS might be interesting to consider water vapor feedback’s effect on stratopsheric temperatures as well – actually, Chris mentioned several posts back using tools from another website to create spectra of OLR – I should check that out! Patrick, I can animate whatever we come up with. I’m committed to creating such an illustration and can wait for you to sketch out your idea by any means convenient. Scanned sketches would be fine too; or we can email source files (Do you have Adobe Illustrator?). I think I know what you’re describing in the cross section, black sky, and three vantage points. I’ll dabble with that. You did not include people like me. Those who have learnt all they know from the Internet over many hundreds of hours. So we can be surprisingly well informed while still being stunningly ignorant. First step basics, that rarely get mentioned after first year are beyond us, but we know of the Petermann Glacier calving within hours. So you might get an insightful comment one minute and utter stupidity the next. Our bias may be induced by where we came into the argument, not through any underlying philosophy; or you could be talking to a total jackass. Does make it very hard, but some of us appreciate your efforts. I decided to create the figures in part using a Microsoft Excel spreadsheet. for each row, in three columns. This gives a random (x’,y’,z’) coordinate for each data point. z’ (which is sigma in atmospheric science-speak) is converted to a height coordinate z” in the graph by first multiplying by 1000 to get p’ (an approximate pressure in mb) and then using a function z”(p’) given below. I tested this simpler version and it matches the original. This is a compromise between graphing over geometric height (where density decays roughly exponentially with height, never quite reaching zero but getting close enough that a finite cutoff height can be assigned) and graphing over pressure or in proportion to sigma (where the ‘density’ would be constant, and thus, without the effects of variations in line broadenning and line strength (which I have decided not to deal with), vertical optical thickness would be proportional to vertical distance on the graph). This is to show that density decreases with height, but emphasizing the part of the atmosphere with most of the optical thickness and allowing TOA (top of atmosphere) to appear at a finite height (in approximation, allowing the very rare data point that is above the assigned TOA to not appear on the graph). It is somewhat ad hoc because I drew a temperature profile in a paintbrush file first and then tried to fit a realistic z” to what I drew. … So data points are generated with random x,y,z” coordinates in each row. Two series are plotted. Each series has 16384 data points (4 doublings relative to 1024). no gridlines shown. The x axis has no labels so that the graph could be expanded to the right size to fit the paintbrush file work. x is calculated by taking x’ and multiplying by 10/af$327 (series 1) or 10/af$328 (series 2), where af$327 and af$328 are numbers between 0 and 1 that determine what fraction of the data points actually appear in the plot – thus they are proportional to the atmospheric optical depth depicted for each grouping of gas(es). In the event that af$327 or af$328 is 0, the formula sets x to 100 for that series, removing all data points from the plotted domain (this shouldn’t be necessary, as dividing by zero would yeild an error, which wouldn’t be plotted). where Y327 and Y328 are the number of doublings relative to 1024 data points in the graph, except that -10 is used to produce zero data points in the graph (it would otherwise be 1, but what would the usefulness of showing 1 data point be in this context?). 4 is the maximum number of doublings for the number of rows I used. The chart uses the x values for the x coordinate and the z” values for the plot’s y coordinate. The actual y value would simply be a constant times y’. I could use this for creating plots to produce images depicting the atmosphere’s effect on what is seen looking up or down from various positions, but I’d expect it would be much easier to do so with other software, so I haven’t gone that far yet. In the paintbrush file, I used a series of colors to represent an intensity scale for radiation corresponding to a temperature scale; the colors shift from brighter to darker at the same time as they shift from yellow to red, so that in effect the scale goes (in increasing corresponding temperature) from black, to dark red, to orange, to light yellow, to white. I add shades of blue and green for a few rows of pixels corresponding to the thermosphere, which is just a tiny slice of the picture. I drew a intensity profile for the atmsophere on one side and extended the corresponding colors horizontally. Copying and pasting the chart into a copy of the paintbrush file and aligning properly (using a mark on the paintbrush picture and the vertical axis tick marks on the plot), using white as the transparent background, gives a representation of a cross section of the atmosphere as it may appear at some wavelength in the LW portion of the spectrum. Chris Colose, could I email you some samples and could you forward them to john g? Someone with access to software better suited to this purpose might similarly produce data points, but with greater flexibility in the total number that can be shown, and with animation, have different series/objects (water vapor, CO2, other gases – maybe O3, clouds of different heights) flash, be hidden underneath other objects at the same location, etc, to show how overlap works; the graph might be three-dimensional and perhaps one could have animated fly-throughs, look at different angles, take layers apart and look up and down from different positions, etc (The most basic part – views looking up and down from different vertical levels – I’ll draw some samples of that). The colors of the data points could be directly determined as a function of their z values – a function which could be altered when discussing climate change (showing how warming/cooling occur to rebalance the radiative fluxes), etc. A website for this purpose might have some sidebars explaining (with illustrations) the distinction between intensity and flux per unit area, and also explain how the finite-size opaque objects represent approximately how the greenhouse effect works, but also how in actuality one would see a smoother-looking haze (the total number of objects per unit volume must be such as to preserve their total area to depict a given optical thickness per unit distance; otherwise they can be shrunk for more accurate depiction; when the optical thickness is so large that the objects must be packed tightly or share volume, then the depiction loses accuracy, but this doesn’t matter if the objects are small enough to be nearly isothermal…). I’ll write some text (and some drawings) that could be used to describe these things. (this shouldn’t be necessary, as dividing by zero would yeild an error, which wouldn’t be plotted). I meant to remove that before I posted it, because #DIV/0! is plotted as 0.